nice idea - and after reading it - I want more. quite nice, good concept with the art / music sections, i look forward to more and more issues! neutralized... bah it's cool and so but also it's more like a mini-diskmag rather than an artpack. "Though it seems like old stuff packed together ..."
Weird thing, the concept is weird, the graphics is weird and music old. Weird. I like Noogmans graphics. And nice to hear some legendary oldies again, Timm. "...In each individual edition you'll find a background story, an interview and samples of the work of the contributing musican and graphican. You get to learn how the artist joined the scene. Where and why he started, and what he wants to do with his endowment in a few years. You'll discover some scene legends from the past, who have their roots in the demoscene and who are nowadays working for influential game companies. You will read an actual interview and find some samples of their work which will be selected by the contributing artist himself. A mixture composed of his or her most liked old and/or new productions. ...."
A full blow of oldskool feelings, music, graphics and charts. Interface is a bit buggy or is it a Vista problem? Magic: Before judging I would at least recommend to ***READ*** the product that you'd like to criticize. Congratulations with releasing this - it looks and sounds great. The idea behind the content is original and I`m sure will always provide a very interesting read. Good concept, loking forward for more. ah how refreshing. best luck for the upcoming issues! Ghandy: true that my comment was based on a global look at it.. So let this be known.. No time to take a intensive peak at it.. still thumb is more than worth it..
Crashes like a wasted whore here. still a nice Concept.! (i know of it for over a Decade already...lol :) ) Get Issue #02 released now.! rulez added on the 2007-09-30 20:11:28 by ɧ4ɾɗվ. i enjoyed the content and the concept. Keep them coming! Mudia Art is an unusual diskmag. It focuses totally on music and art. In each issue, 1-2 musicians and 1-2 graphicians are introduced with interviews and samples of their work. That's pretty much it. It's a quick read, but if you want, you can spend a lot of time checking out the artworks and analyzing them. 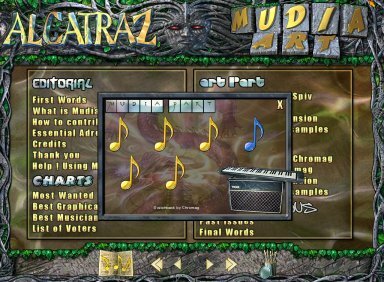 The main editors of MudiaArt are s7ing of Alcatraz, and Mop. The code was done by T$ of Alcatraz, and the interface graphics are from Noogman of Alcatraz. All issues released so far can be downloaded from the Alcatraz website. also very well designed. Too bad the contrast between the font and the background is a bit low. The font used also isn't the best possible one. The controls work with mouse or keyboard. When scrolling with the mouse, it is a bit irritating that there are no buttons for page-wise scrolling. Instead there are some for line-wise scrolling and some that will scroll about half a page. editors. The featured artists of this issue are the graphician Spiv and the musician Chromag, both of whom are from Germany. Apart from the five sample tunes by Chromag, there's a bonus track by pOWL of Alcatraz. It's a nice first issue that has some flaws but is in general well executed. page created in 0.017797 seconds with 15 queries.